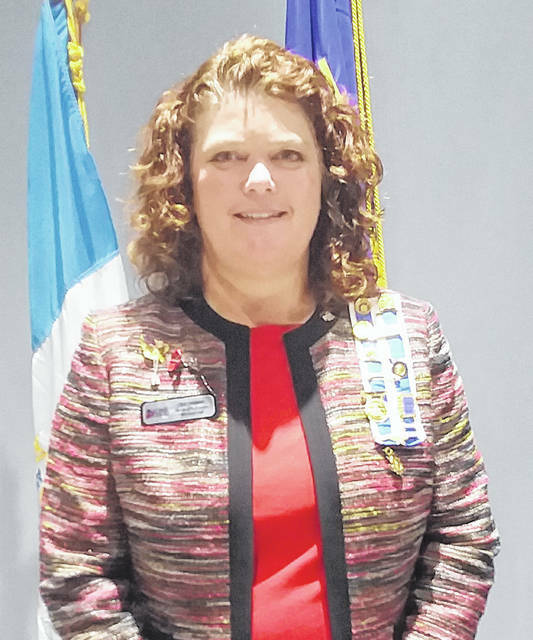 Chris Nehring, Air Force Technical Sergeant (E-6) Retired, who is also the OSDAR Southwest Director, presented a program about women’s early involvement in World War II. The Urbana Chapter Daughters of the American Revolution met on Saturday, Nov. 17, at 9:30 a.m. at BrownRidge Hall in celebration of Veterans Day. In attendance were 20 members, three prospective members, 11 guests and 14 veterans. A quorum was established. The DAR opening ritual was led by Regent Kim Snyder and acting Chaplain Lana Seeberg. Regent Snyder recognized special guests Chris Nehring, Ohio Society Southwest District Director from the Greenville Chapter; and the members of the VFW/DAV Posts. The events of the day began with a Veterans Day Reading delivered by Pat Detwiler and a tribute to veterans titled “Never Forget,” delivered by Regent Kim Snyder. In celebration of the 100th anniversary of the end of World War I, The Urbana Chapter DAR World War I Singers presented a medley of popular music of the day. The singers were directed by Dr. Janet Ebert and accompanied by Joanna Woodburn. An “Honor Flight Welcome Home Event” was recently held at the Dayton International Airport. 104 veterans from WWII, Korea and Vietnam traveled to Washington D.C. and were welcomed home by a military band, honor guard, other veterans, their families, and Boy Scouts young and old, as well as Urbana Chapter DAR members Pat Detwiler, Connie Flanly, Kim Snyder and Dona Tullis. Pat Detwiler reported on the Wreaths Across America project. This event will be held on December 15 at Oak Dale Cemetery and will occur simultaneously with the wreath laying across the nation. The VFW/DAV will provide the Color Guard for the ceremony. At least 50 volunteers from across the community are needed to make the laying of the wreaths possible in a reasonable amount of time. Volunteers should send an email to Pat Detwiler at tdetwiler2@woh.rr.com. Orders for approximately 461 wreaths (and counting) have been sponsored by individuals and organizations. The Auxiliary to the VFW/DAV, Walter & Lewis Funeral Home, Lion’s Club, Perpetual Federal Savings Bank, the Champaign County Auditor are among the major sponsors. Special thanks goes out to the local VFW/DAV Posts who sponsored the original goal of 250 wreaths. A special presentation of a Wreaths Across America pin was given to Pat Detwiler for her hard work and dedication to the project. The program concluded with a Veteran’s Prayer given by Lana Seeberg. The President General’s Message was given by Judy Kathary. President General Ann Turner Dillon reminded members of the many things for which we can be thankful among those being our Patriot ancestors. Margaret Denzer presented the National Defense Report discussing the “I” generation. Regent Snyder thanked hostesses Judy Brooks, Lana Seeberg, and Dixie Burdick. Regent Snyder stated that the goal of the Urbana Chapter DAR is to continue and expand the Honor Flight participation, and also to continue and expand the Wreaths Across America project. Megan Snyder is making pillows to be given to the VA hospital, and some of those were on display. Members were thanked for their many donations of personal care products for this service effort. Mary Pollock will be delivering items donated by the chapter to the VA hospital. The next meeting will be held on Wednesday, December 12, at the Urbana Country Club. The Champaign County Dulcimer Club will perform and there will be an installation of our first Honorary Chapter Regents. Members were urged to get their reservations to Judy Brooks. Registrar Dona Tullis reported that as of October 15, 2018, the chapter has 86 members, and 5 prospective members. Judy Henson reported that 1,900+ volunteer and service hours have been reported by chapter members to date. Peg Neiswander reported that applications for the DAR Good Citizen Awards and the American History contests are in process. Becky Shultz reminded members to distribute the Urbana Chapter DAR membership brochures.